The Kong mooring snap hooks are the safe and easy solution for connecting a mooring line to a mooring buoy. 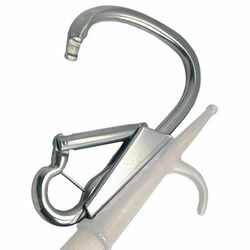 These channeled snap hooks fit onto the end of boat hook poles (and other poles, using the included backing plate). This is a life saver on high bowed vessels approaching a mooring. Reach out with the boat hook and hook carabiner inside attachment point. Then simply pull back on the boat hook and the carabiner snaps shut as it slides free of boat hook pole and you're now clipped into the mooring eye. Made from 316 stainless steel. what size mooring rope will this fit ? I use both sizes on a daily basis as a captain for TowBoatUS. I am able to attach a tow line to a bow eye without getting too close to the vessel being towed.